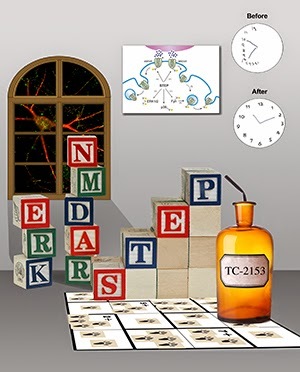 The compound, TC-2153, inhibits the negative effects of a protein called STtriatal-Enriched tyrosine Phosphatase (STEP), which is key to regulating learning and memory. These cognitive functions are impaired in Alzheimer’s. “Decreasing STEP levels reversed the effects of Alzheimer’s disease in mice,” said lead author Dr. Paul Lombroso, professor in the Yale Child Study Center and in the Departments of Neurobiology and Psychiatry at Yale School of Medicine. Lombroso and co-authors studied thousands of small molecules, searching for those that would inhibit STEP activity. Once identified, those STEP-inhibiting compounds were tested in brain cells to examine how effectively they could halt the effects of STEP. They examined the most promising compound in a mouse model of Alzheimer’s disease, and found a reversal of deficits in several cognitive exercises that gauged the animals’ ability to remember previously seen objects. High levels of STEP proteins keep synapses in the brain from strengthening. Synaptic strengthening is a process that is required for people to turn short-term memories into long-term memories. When STEP is elevated in the brain, it depletes receptors from synaptic sites, and inactivates other proteins that are necessary for proper cognitive function. This disruption can result in Alzheimer’s disease or a number of neuropsychiatric and neurodegenerative disorders, all marked by cognitive deficits. Other authors on the study include Jian Xu, Manavi Chatterjee, Tyler Baguley, Jonathan Brouillette, Pradeep Kurup, Debolina Ghosh, Jean Kanyo, Yang Zhang, Kathleen Seyb, Chimezie Ononenyi, Ethan Foscue, George Anderson, Jodi Gresack, Gregory Cuny, Marcie Glicksman, Paul Greengard, TuKiet Lam, Lutz Tautz, Angus Nairn, and Jonathan Ellman. The study was funded by the National Institute of Health, the American Health Assistance Foundation, and the Alzheimer’s Drug Discovery Foundation.